A 21-year age difference was not the only thing that separated Frank Foutz from his older brother Dave. There was also a vast disparity in their abilities. Pitcher-first baseman-outfielder Dave Foutz was among the late 19th century’s most accomplished baseball players. Four years after Dave’s untimely death in early 1897, young Frank Foutz became a 20-game first baseman for the Baltimore Orioles. Thereafter, Frank played ball on and off for another 10 years, putting up sometimes decent numbers in the minors. But he never received another big-league shot. After leaving the game, Frank receded into the anonymity of private life, passing away quietly on Christmas Day 1961 at age 84. Frank spurned Brooklyn, signing instead with the Baltimore club that John McGraw was organizing in the fledgling American League.14 There was no shortage of aspiring players in camp for the Orioles, but a home run in a late-spring exhibition game secured Foutz’s place on the Opening Day roster. 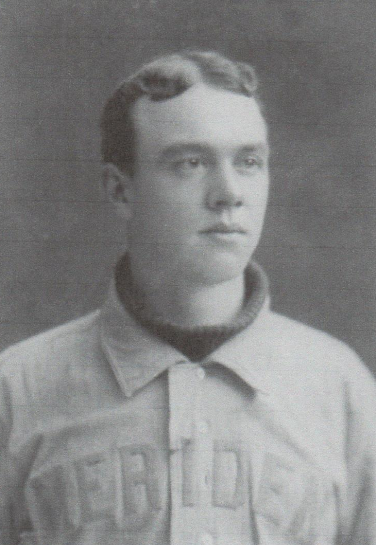 The now 24-year-old made his major-league debut in Boston on April 26, 1901, going 0-for-3 against left-hander Win Kellum, with a walk and a run scored, in a 10-6 Baltimore win. In the field, he handled 12 chances at first base flawlessly. Three days later Foutz slugged the first major-league homer, in Washington’s American League Park (I). On May 1 he hit another four-bagger against Washington, leading the Worcester Daily Spy to report that “Frank Foutz, the Connecticut League youngster who has been playing first base for Baltimore, is more than holding his end up in the American League ranks.”15 And so he was, although a tendency to strike out (13 whiffs in 72 at-bats) was becoming a concern. But Frank’s problem was not really his bat; it was his right arm. Following a late-May Orioles road trip, Sporting Life related that the Baltimore team “has been somewhat crippled, [George] Rohe being compelled to play first base in place of Foutz, who has developed a lame arm.”16 Thereafter, it was reported that “Frank Foutz has been admitted to the medical ward of [Harrisburg Hospital] suffering from rheumatism” in the arm.17 Unfortunately for Foutz, he played in a cold-blooded age during which unavailability was not countenanced, particularly when the disabled player was a rookie. Predictably, skipper McGraw released the ailing Foutz.18 Although he would continue playing professional ball on and off for another 10 years, the major-league career of Frank Foutz was now over. In 20 games, he had batted a Deadball Era-respectable .236 (17-for-72), with two home runs among his seven extra-base hits. He had scored 13 runs, while driving in 14. Foutz had also played tolerable defense, with only eight errors in 195 chances (.959 FA), all at first base. The arm problem would continue to plague Foutz, but he quickly caught on with the Toledo Mud Hens, the bottom dwellers of the then-unclassified American Association, alternating between the outfield (69 games) and first base (36 games). It was soon reported that “Foutz, formerly of Baltimore, is putting up a good game for Toledo.”19 He finished the season batting .300, with power: 51 extra-base hits, including 13 home runs.20 Foutz continued his heavy hitting for Toledo the following season, batting .333 with a .500 slugging percentage in 18 games when, discouraged by chronic arm miseries, he abruptly quit the club and headed west. For the next several years, Frank resided with his oldest brother, John, in Leadville, Colorado. John Foutz, who at one time had been the catcher-captain of a Colorado State League champion club, was now a prosperous hardware merchant and gave Frank employment. On weekends and holidays Frank was available for semipro games at $15 per contest.21 Around 1906, he returned home to Baltimore and rejoined the family business, now run by his brothers Stanley and Howard. Frank re-entered the ranks of Organized Baseball in 1908, signing with the Lima (Ohio) Cigarmakers of the Class D Ohio State League. Lima, the abode of his new wife, the former Gertrude Jones, would prove a congenial place. Frank remained a Lima resident for the rest of his life, and his only child, a son named Orville, was born there in August 1909. Back on the diamond, the now 31-year-old Foutz became an everyday outfielder for the “Stogies,” batting .271 with 42 extra-base hits for the second-place (80-67) club. The following season, he returned to Lima, but both his batting average (.228) and power numbers (24 extra-base hits) fell off. Still, Foutz received a late-season tryout with the last-place Pueblo (Colorado) Indians of the Class A Western League and hit well, going 20-for-64 (.313) in 18 games. He began the 1910 campaign with the Muscatine (Iowa) Pearl Finders of the newly formed Class D Northern Association, but was sold by the club shortly before the circuit went under in mid-July. Frank finished the year in faster company, batting .252 in 98 games for with the Davenport (Iowa) Prodigals of the Class B Three-I League. Frank Foutz completed his professional baseball career back in the Ohio State League, batting .271 in 76 games for the 1911 Chillicothe Infants. Released by the club in late July, he went home to Lima and found work as a conductor for the Ohio Electric Railway. The next two decades were good ones for the Foutzes – apart from a singular family tragedy. On January 14, 1918, 8-year-old Orville Foutz died, the victim of pneumonia.22 Thereafter, the Foutzes regrouped and prospered, with wife Gertrude supplementing the couple’s income by running a successful florist shop. In time they opened a restaurant as well. But as with many others, the coming Great Depression took its toll. Frank lost his conductor job when the railway went bankrupt, and the Foutzes’ side businesses failed. By August 1931 the family home was in foreclosure.23 From there, Frank slowly rebuilt his life and the family bank account. He obtained a job with the Lima Street Department, and by the mid-1940s was employed as an inspector by the Lima-Hamilton Corporation, a manufacturer of construction machinery. In April 1950 Gertrude Foutz died. For the next decade, Frank lived alone, alternating between home in Lima and a winter residence in Florida. He retained a keen interest in baseball, was a frequent attendant at Lima Stogies games, and was the club’s guest of honor on Opening Day 1951.24 As he entered his 80s, Frank began to suffer the effects of heart disease. Admitted to Lima Memorial Hospital in December 1961, he died there on Christmas morning at age 84. The official cause of death was congestive heart failure.25 At the conclusion of funeral services at a local mortuary, he was interred besides his wife and son in Woodlawn Cemetery in Lima. Survivors included his sister Elizabeth Foutz Joesting and brothers Stanley and Howard Foutz. Sources for the biographical information provided herein include the Frank Foutz and Dave Foutz files maintained at the Giamatti Research Center, National Baseball Hall of Fame and Museum, Cooperstown, New York; US Census and family tree information accessed via Ancestry.com; and certain of the newspaper articles cited below, particularly the obituaries published in the Lima (Ohio) Daily News, December 26, 1961, and the Lima (Ohio) Citizen, December 27, 1961. Unless otherwise noted, stats have been taken from Baseball-Reference. 1 The other Foutz children were John (1855-1928), David (1856-1897), Evelyn (1859-1905), Margaret (1860-1938), Joseph (1862-1865), Hervey (1865-1948), William (1869-1951), Elizabeth (1871-1962), Stanley (1874-1963), and Howard (1879-1967). 3 Sporting Life, September 11, 1897. 4 Sporting Life, January 29, 1898. 5 As reported in the Cincinnati Post, February 2, 1898; Rockford (Illinois) Daily Register, February 15, 1898; and Philadelphia Inquirer, February 20, 1898. 6 As per Sporting Life, April 30, 1898. See also, Paul W. Fitzgerald, “Faces Change … Game’s the Same,” Lima (Ohio) Daily News, April 22, 1951. Foutz’s salary with Toronto was $250 per month. 7 Sporting Life, May 7, 1898. Baseball-Reference lists Foutz as going 2-for-5 at the plate during his brief time in Toronto. 8 As reported in Sporting Life, May 28, 1898. 9 See Sporting Life, June 23 and 25, 1898. 10 As per the Naugatuck (Connecticut) Daily News, June 7, 1900. 11 As reported in Sporting Life, June 16, 1900. 12 As per the 1901 Reach Guide, 123. 13 According to Fitzgerald, Lima Daily News, April 22, 1951. 14 As reported in the Baltimore Sun, January 11, 1901, Cincinnati Post, January 12, 1901, and elsewhere. 15 Worcester Daily Spy, May 2, 1901. 16 Sporting Life, June 8, 1901. 17 According to the Harrisburg (Pennsylvania) Patriot, June 3, 1901. 18 As per the Boston Herald, June 6, 1901. 19 Boston Herald, July 14, 1901. 20 See the 1902 Reach Guide, 237. Baseball-Reference has no 1901 minor-league stats for Foutz. 21 Fitzgerald, Lima Daily News, April 22, 1957. In the early 1880s, Dave and John Foutz had formed a formidable battery for the Leadville Blues. At 6-feet-3 and 141 pounds, John Foutz was even more spindly than the rail-thin (6-2/161-pound) Dave. 22 As reported in the Lima Daily News, January 15, 1918. 23 As per the Lima Daily News, August 14, 1931. 24 Fitzgerald, Lima Daily News, April 22, 1951. 25 Frank Hayes Foutz death certificate, contained in his file at the Giamatti Research Center.